Wilmington, NC: While a trip to the coast is most often associated with summertime, visitors to Wilmington, North Carolina and its island beaches during the winter months will find there’s no shortage of things to do. In fact it’s a favorite time of year for locals like Gwenyfar Rohler, an author and bookstore owner who shares what she enjoys most about winter in Wilmington in a recent blog: Loving Life like a Local in the Off-Season. For those who prefer to “winter” with an ocean view, there’s plenty to do at nearby beaches where ocean sunrises and dolphins greet the day, and uncrowded beaches invite walking, running and shell-seeking. A variety of enticing events take place during February and March, starting with two signature events held in Wilmington’s walkable River District during the first weekend in February. By day visitors can indulge in decadent tastings at the Wilmington Wine & Chocolate Festival (Feb. 2-4), then by night be entertained by all-star jazz artists during the 37th Annual North Carolina Jazz Festival (Feb. 1-3). Dozens more events include beach music and craft beer gatherings, home shows, arts and cultural happenings, races and family-friendly activities. Here’s a sampling of midwinter events from the river to the sea. Feb. 1-3: North Carolina Jazz Festival. One of the largest traditional jazz festivals in the Southeast, this STS Top 20 Event features more than a dozen traditional and swing jazz musicians who perform for three evenings in an intimate cabaret-style setting. Admission charge. For hotel reservations and festival rates, contact the Hilton Wilmington Riverside: 910-763-5900. Feb. 2-4: Wilmington Wine & Chocolate Festival. Fri. 7pm-10pm; Sat. 11am-6pm & Sun. 12pm-4pm. Friday’s Grand Tasting features hors d&apos;oeuvres, live jazz, artisan exhibits, craft beer lounge and comedy show. On Saturday and Sunday, a European-style marketplace with 50+ ‘shops’ provides a tasting tour of Carolina wineries and signature chocolatiers. Live acoustic music, specialty foods, artisan products, cooking demonstrations and kids’ activities. Tickets required. Coastline Conference & Event Center, Wilmington. Feb. 8-10: East Coast Shag Classic. Beach music lovers along the East Coast travel to Wrightsville Beach for a weekend of shag-dancing, live concerts, a silent auction, social mixers, complimentary dance lessons and more. Tickets required. Holiday Inn Resort, Wrightsville Beach. Feb. 24: Tidewater Camellia Show & Sale: 10am-5pm. With a reputation as one of the largest and best attended shows in the U.S, more than 1,000 blooms will be evaluated by the American Camellia Society judges. Expert growers will answer camellia questions. Free. New Hanover County Arboretum, Wilmington. Feb. 24: Wilmington Wine & Beer Walk. Self-guided tasting tour of downtown restaurants and drinking establishments. Tickets required. Begins at Front Street Brewery, Wilmington. March 10: Cape Fear Beer & Wine Festival. Top quality beers and wines made by the world’s most enthusiastic and enterprising brew masters and vintners. Tasting, sampling and education is at the core of the CFBWF experience with over 125 brews and wines, live music and more. Wilmington Convention Center, Wilmington. March 17: Wilmington St. Patrick’s Day Parade & Festival. Come join the music, dance and fun with Wilmington Police Pipes & Drums, The Blarney Broughs, The Molly Malones, The Walsh Kelley School of Irish Dance, Slainte UNCW Irish Dance Club and more! Parade starts at 11:00 am at Red Cross and N. Front Street. The annual St. Patrick&apos;s Day Festival begins at noon. Riverfront Park, Wilmington. March 23-April 1: Cape Fear Craft Beer Week. A weeklong showcase of local breweries, bottle shops, restaurants, and craft-centric businesses. Events highlight beer brewed in the Cape Fear region and venues where craft beer is served. Various venues, Wilmington, Carolina Beach, Wrightsville Beach. March 24: Coastal Living Show. This STS Top 20 Event features 60-plus home and garden vendors with products and services for seaside living. Wilmington Convention Center, Wilmington. March 29-April 4: Encore’s Wilmington Spring Restaurant Week. Choose from more than 30 restaurants during this seven-day event featuring prix fixe menus at a special price for breakfast, lunch, dinner and dessert. Click the link above for a list of participating restaurants. March 31: Cape Fear Craft & Cuisine. A premiere food and beer event in an elegant coastal garden setting that pairs fine cuisine prepared by local chefs with local and N.C. craft beer. Airlie Gardens, Wilmington. And that’s not all…There’s music, theatre, art, dance, museums, Weeki Wachee mermaids and Dinosaurs! Feb. 9 & 10: Hugs and Fishes Valentine’s Lock-in. Overnight event, ages 5-12. Preregistration. NC Aquarium at Fort Fisher, Kure Beach. Feb. 11: Autism Friendly Day. A day of discovery designed for people living with autism. NC Aquarium at Fort Fisher, Kure Beach. Feb. 10: Civil War Battle Lecture & 2-Mile Hike. Carolina Beach State Park. March 10: Battleship FirePower Tour. Battleship NORTH CAROLINA, Wilmington. March 19-Sept. 30: Dinosaurs! Animatronic dinosaurs roar, spit and wow visitors in a natural garden setting. NC Aquarium at Fort Fisher, Kure Beach. Feb. 10: Wrightsville Beach Valentine Run. 5K, 10K, 15K. Wrightsville Beach Park. Feb. 17: Special Olympics Polar Plunge. Oceanfront Park, Kure Beach. March 17: Steve Haydu St. Patrick’s Lo Tide Run. 5k, 10k. Carolina Beach Boardwalk. March 17: US Open Fat Bike Championships (STS Top 20 Event) Blockade Runner, Wrightsville Beach. March 16-17: Wrightsville Beach Marathon. Start: Wrightsville Beach Park to UNCW. Feb. 2-3; 9-10; 16-17: Senior Moments, TheatreNOW, Wilmington. Feb. 8-11; 15-19; 22-23: Buyer and Cellar, Thalian Hall Center for Performing Arts, Wilmington. Feb. 18 & March 18: Shakespeare Brunch. TheatreNow, Wilmington. Feb. 1-4; 8-11; 15-18: Who Am I This Time? Cape Fear Playhouse, Wilmington. Feb. 9-11; 16-18: Oliver! Musical. Thalian Hall, Wilmington. Feb. 12-14: Oscar-Nominated Shorts (2018). Thalian Hall, Wilmington. Feb. 20-21: Cabaret (Broadway musical). CFCC Wilson Center, Wilmington. Feb. 23-24; March 2-3; 9-10; 16-17; 23-24: The Weir. TheatreNOW, Wilmington. Feb. 28-March 4; March 9-11: NINE. Thalian Hall, Wilmington. March 8-11, 15-18 and 22-25: Fences by August Wilson. Cape Fear Playhouse, Wilmington. Feb. 2: The Birdland All Stars featuring Tommy Igoe. Thalian Hall, Wilmington. Feb. 2-3: Divine Divas II. 2nd St. Stage, Hannah Block Historic USO/Community Arts Center, Wilmington. Feb. 3: Wilmington Symphony Orchestra-Dance of the Coin & Polovtsian Dances. Wilson Center. Feb. 6: Art Garfunkel. The Wilson Center, Wilmington. Feb. 8: Jazz at the CAM with Jo Gore. Cameron Art Museum, Wilmngton. Feb. 8: NC Symphony: Daphnis and Chloe. Wilson Center, Wilmington. Feb. 14: LaBouche – Valentine Show. CFCC Wilson Center, Wilmington. Feb. 15: An Evening of Valentines with Emile Pandofi and Dana Russell. Thalian Hall, Wilmington. Feb. 17: The Great American Songbook Live: The Oscars. UNCW Kenan Auditorium, Wilmington. Feb. 22: Scott Bradlee’s Postmodern Jukebox. Wilson Center, Wilmington. Feb. 25: The Temptations & Four Tops. Wilson Center, Wilmington. Feb. 28: Celtic Tenors. Wilson Center, Wilmington. March 1: Jazz at the CAM with Light Under the Sun. Cameron Art Museum, Wilmington. March 2: The Midtown Men. Wilson Center, Wilmington. March 8: Henry Cho in concert. Thalian Hall, Wilmington. March 15: Daughtry in concert. Wilson Center, Wilmington. March 16: The National Symphony Orchestra of Cuba. Thalian Hall, Wilmington. March 24: Symphony POPS! Wilson Center, Wilmington. March 26: Rockin’ Road to Dublin. Wilson Center, Wilmington. Feb. 17-18: Art For All. Marketplace with 60+ local artists. Brooklyn Arts Center, Wilmington. Feb. 23 & March 23: Fourth Friday Gallery Walk. Various venues, 6pm-9pm. March 31-April 1: Handmade in NC 2018. 50+ vendors. Brooklyn Arts Center, Wilmington. *Photographs by Hugh Morton: An Uncommon Retrospective. Wilmington native Hugh Morton’s (1921-2006) photographs span eight decades, showcasing his love for NC’s people, events, landmarks, nature, sports and tourism. *Playtime! (March 16 through Sept.) Explore how we play, create and use imagination through a selection of objects from the museum’s historic toy collection and hands-on activities. *Art Exhibit: Created By Light (through February 11). Examines the evolution of photography highlighting the medium and the connections between featured NC artists and institutions. *State Of The Art/Art of The State (through July 8). Contemporary art by more than 630 artists currently living in, or native to, the state of North Carolina. *Death & Dying. This exhibit covers many aspects of death and dying, from funeral practices and mourning stages to cultural traditions and personal choices, explored via art and fashion. Stray off course and see where the water takes you! From the island beaches of Carolina Beach, Kure Beach and Wrightsville Beach to Wilmington’s river district, visitors will find festivals, art and cultural events, museums and outdoor activities to cure the winter blues. For special offers and seasonal highlights, click here. 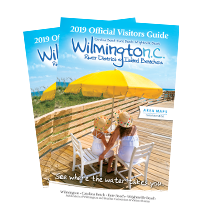 For a Free Official Visitors Guide, call 1-866-266-9690 or email visit@wilmingtonandbeaches.com. Insider Tips: Event details often change without notice and/or sell out in advance, so please confirm event date, time, place before traveling any distance.